The GMAT exam is administered worldwide in accordance with US and applicable local laws. Special registration guidelines, taxes, identification requirements, testing rules, and privacy policies, as applicable, will apply in certain locations and to citizens of certain locations. For the most up-to-date, location-specific policies, candidates can visit Location Specific Test center policies / Guidelines [Click Here]. 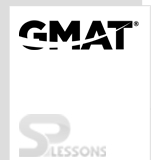 Certain locations have specific regulations that must be followed to take the GMAT exam. Candidates should select the location of interest to take the exam to understand the Identification Requirements, Test Center Rules and Agreement and if VAT applies. Candidates should also view the Privacy Statement for the respective location. If the candidate is unable to locate his/her location on the Location List, there are no identification exceptions, and the candidate must present his/her passport book for entrance to the test center.